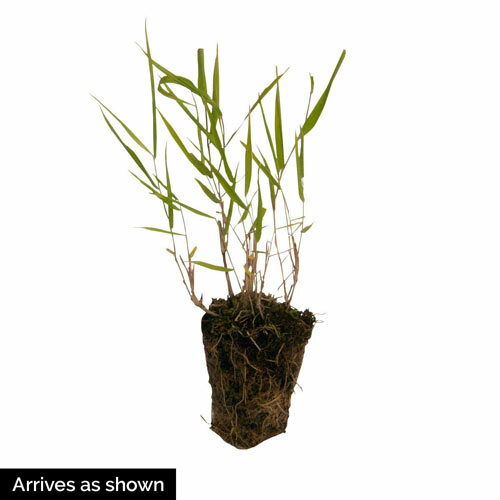 Beni Kaze Japanese Forest Grass | Gurney's Seed & Nursery Co. Slender, bright green, softly flowing leaves form a flowing mound shape that's very attractive in borders and the garden. 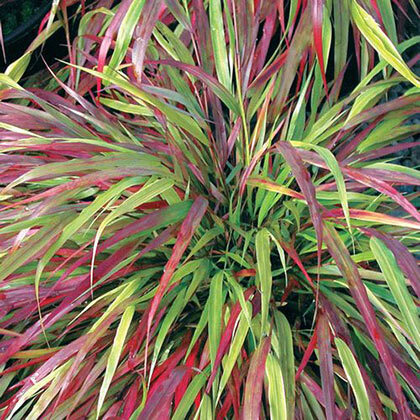 In late summer, green blades develop red streaks that progress to deep red, orange and gold in late fall. Deer tend to avoid. Grows 18-24 in. tall. Plant in full sun to partial shade. FoliageMounds of arching linear green leaves which turn to rich red tones in Fall. CommentsFlowing mound of green grass blades that turn brillant red for the Fall season. Great for cascading over a bank or retaining wall. Tolerates a light shade area without compromising on the great Fall color. Compliments most broad leaf plants nicely in the landscape setting. DepthPlant at same depth as it is in the pot.